Beautiful Gulf views from your 6th floor screened-in, balcony. Sunsets every night over the sparkling waters, barrier islands and Sanibel Island! Our Sanibel Harbour beachfront vacation condos are well-appointed with a delightful palate of seaside coral and blue/green tones to make up an appealing Florida style decor. Equipped with newer appliances, furniture, and crown molding throughout. There is a TV in the living room and both bedrooms, and a DVD player. 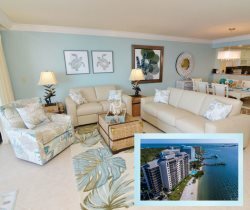 Enjoy a meal on your furnished balcony while watching for dolphins in the water below! King bed in the master and queen in the guest bedroom... Sleeps 6 people. You may have found this rental on HomeAway 4363839, HA ID 4363839, VRBO 4363839, or Vacation Rentals 4363839. Everything was handled thoroughly through email. We felt very comfortable with then entire process. When we needed our boarding passes printed for our flight home, the staff was very helpful. We had a very relaxing week. The view was fantastic. We even saw dolphins and manatees in the water below our condo! Great team. They were extremely helpful. When there was no DVD in our room, Irene bought one and installed it. Thank you and thanks to all the staff. This property was absolutely wonderful! We will be back!! Quick to act. Helpful and friendly. This place was a great vacation spot!! We plan on returning next year for sure!!! Pleasant experience, only once did I not reach a live person. Very enjoyable stay. Older but very well maintained. Nice, beachy unit. Incredible bay views, wonderful place to watch Pelicans and dolphins from your screened in lanai. Convienient location. The lady who helped us when we arrived was very pleasant and helpful when I realized I didn't have the lock box code. When we checked out, a friendly young lady printed out our boarding passes. We had a lovely stay. The two bedroom/ two bath room was aesthetically pleasing, spacious, clean, comfortable, and had everything we needed. The view was great. Every morning we had our coffee on the balcony and were treated with a glimpse of an occasional view of a dolphin, manta ray, turtle, or manatee. And this wildlife was seen right off of the beach on the property. We would love to stay in this room again. The team members were very helpful and friendly. There were plenty of restaurants in walking distance and it was a short commute to Sanibel/Captiva Island.